Been hot enough for ya? Isn’t it a sad sign of our times that I can write that sentence and know that I am speaking to everyone in America? I can also safely say that if you maintain a garden or lawn, the only number higher than our recent temperatures may be on your water bill. 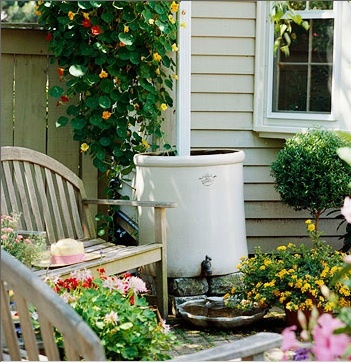 All the more reason for today’s Greener Living post, because we’re talking about rain barrels. A rain barrel is defined as any water tight container that can catch rain. Most people just put a large rain barrel at the end of their gutter downspout and let gravity do the work. A fitted lid on a rain barrel is very helpful in keeping mosquitoes from laying eggs in your clean water. You may also like a spigot for your hose or watering can. Water collected from rain often has lower quantities of chemicals than that of municipal water sources. Rain water can be especially helpful if you have plants that have sensitive pH levels. Rain barrels in the 50-80 gallon sizes are the most popular for gardens. Drinking water is a commodity we Americans take for granted. Lowering the energy costs needed by our communities to collect, treat and distribute clean water helps everyone’s budget. A little conservation by us at home can go a long way to conserve our resources at large. According to the Environmental Protection Agency, every 1 inch of rain falling on 500 square feet of roof can add up to 300 gallons of water. The EPA also estimates that most gardeners in the US could save 1,300 gallons of water just during the hot summer months. How much water does your area average per year? Click here to choose your state and city, and then scroll down to view your average annual rain fall in inches. Compare these inches to your water bill. You may be surprised at the money flooding out of your gutters every year. There are many more affordable rain barrels available today than there were ten years ago. Pictured and linked below are a few of the popular options out there. While you may experience some sticker shock at the initial prices, just remember how much you are already spending to water your lawn. You only have to buy a rain barrel once. Short on space? Consider this flat backed rain barrel. It still holds 80 gallons of water. While we’re thinking about greener barrel options…how about this one? It is made from recycled plastic, holds 53 gallons of water and is now on sale for $79 and only $10 for shipping. Green and budget friendly, my kind of deal! Want to try making your own rain barrel? Check out this great DIY tutorial from Better Homes and Gardens. As the fabulous Tim Gunn might argue, one major issue for many people about rain barrels is the aesthetic. I hear you. You’ve made a beautiful garden and/or spent a lot of money and time landscaping your property to be elegant and tasteful. A big, bright plastic barrel against your house was not part of your plan. Never fear. Paint technology has finally caught up with us and will now allow us to paint plastic. I recommend using Krylon’s “Fusion for Plastic” paints. Krylon is a nationally recognized brand of great spray paint and can be found easily at retailers in most areas. So, there you have it! Another green solution that will save you money, install easily and is available for under $100. You could be saving money before your next water bill arrives! Any of you readers have any other tips for rain barrels? If you have a water bill, are you enjoying savings and a beautiful green lawn this summer? Please share your experiences in a comment and help inspire others as part of our Greener Living Challenge! Posted on July 27, 2011, in Green Living. Bookmark the permalink. 7 Comments. I have a question: Is there any way to hook up a rain barrel to an in-ground sprinkler system? I want to save money, save the environment, but still have a green lawn? I know the best time to water grass is some time in the evening, so the sun doesn’t burn off the water. A lot of in-ground systems come with automatic timers to go on and off whenever you want. Can you use rain water, or do I have to use a hose? To my understanding, you can not hook up rain barrels to in-ground sprinklers due to low water pressure. However, the technology may evolve to find a solution for this issue if more people use rain barrels and ask for it. Until then, you might like the rain barrel above that comes with the solar-powered pump to help your garden hose. Hope this helps! We got a rain barrel last year and it cut a huge amount out of our water bill. We’re actually thinking about getting another one. Thanks for the info about the paint for plastic. I’m all for saving the environment, but I would like it to blend into the house a little more. I’ll look for the paint. Why, oh why, had it never occurred to me to paint a rain barrel? I guess that’s why we have you. I love to help where I can! What’s the cost of a can of spray paint when you could save hundreds of dollars on your water bill? I have four rain barrels. I have used them for a year and a half now and my garden is gratis, thanks to the sun and the rain. It makes every bite of a homegrown tomato feel and taste so good. BTW: I got my four terra cotta plastic 50 gallons from Sams club in spring 2010 for $79. I hope other people can find a great deal like you did. Be sure to check out Sam’s Club, readers!